An easy to use deck focused on swarming the field with monsters using their effects and synergies. While using spell/trap cards as protection and card removal. Add thunder-type monsters to your hand so you can use them to swarm the field. Brohunder searches your deck for any level 4 LIGHT thunder-type monster except another Brohunder. Get Thunder Nyan Nyan for attack power or add Pahunder or Mahunder if you want to swarm quicker. Sishunder can rerteive any monster in this deck from the graveyard except Sishunder and Thunder Nyan Nyan. 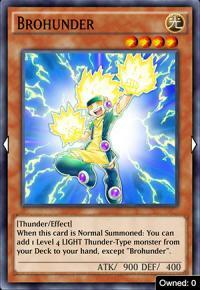 Mahunder and Pahunder basically have the same effects, you can Normal Summon 1 Level 4 LIGHT Thunder-Type monster (which is every monster in this deck.) from your hand as an additional Normal Summon, but they cannot summon a another copy of themselves this way. Summon Mahunder or Pahunder when you have another thunder-type monster in your hand to quickly swarm the field. The main disadvantage of this deck is it's low attack capabilities, it might have a strong 1900 attack beater but that's not so great when considering it is the strongest card in this deck, and all your opponent has to do to beat you is summon a higher leveled monster with decent stats. That is why you need spells and traps for protection. Enemy Controller can change the battle position of an attacking monster to protect you and can also be used to clear for a direct attack. Mirror Wall halves the attack of all your opponent's monsters that declare an attack while it is face-up. Use as monster removal and force your opponent to end the battle phase. 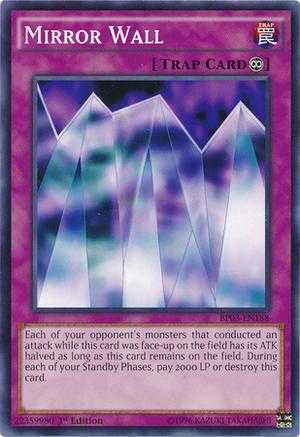 Super Rush Headlong can be used as monster removal and protection. 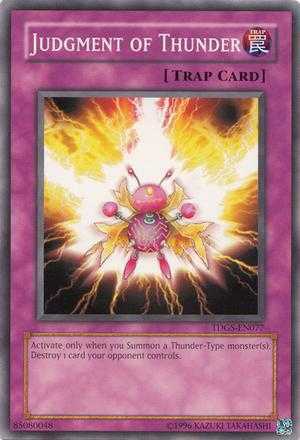 Use Super Rush Headlong to destroy any monster of an attribute you declare for that turn. 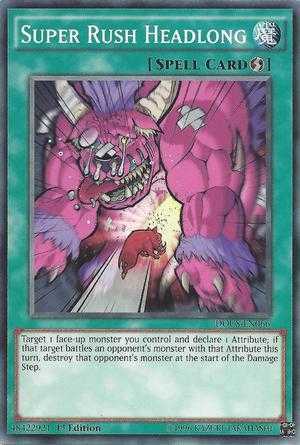 Can be used when your opponent attacks your face-up monster to destroy the attacking monster by card effect. Using card removal can compensate for your lack of offensive power. 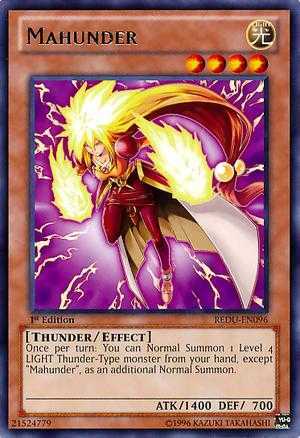 Judgment of Thunder in itself is a good card as it is a free card destuction, the only downside is that it can only be used when you summon a thunder-type monster. 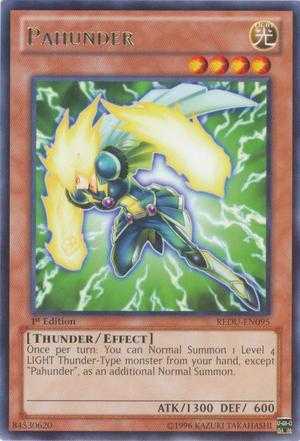 Judgment of Thunder works very well in this deck since all the monster are thunder-type, meaning you can activate it practically anytime. Tribute to The Doomed allows you to destroy an opponent's monster by at the cost of a hand card. This should not be much of a problem since Brohunder and Sishunder is giving you free card advantage. 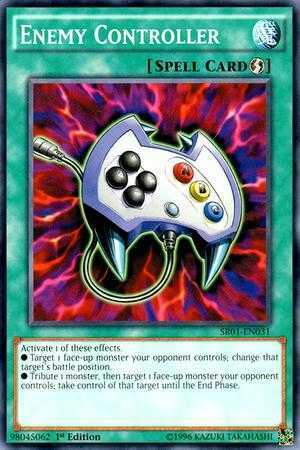 The Calculator A low-leveled thunder type monster meaning it can work well with other monsters in this deck. Easily gets stronger since this deck can swarm quickly. Susa Soldier High attack. 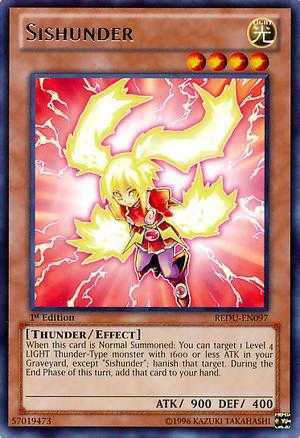 A low-leveled thunder type monster meaning it can work well with other monsters in this deck. Mist Valley Executor Thunder type monster. Return face-up spell/trap cards on the field to the owner's hand. Makiu, the Magical Mist Can be used to clear the field. Luminous Spark Helps you boosts your attack. Kaiba's peak performance boosts attack for all thunder (nyan nyan becomes 2100atk). Sisthunder really isn't useful in this deck and imho 3 brohunders is overkill, 2 should be fine. Thunders can actually be dangerous, but I'm not sure KOG worthy as yet. For fast summon and high attack with a few destruction card.